In the previous section, we stressed the importance of testing the causal link between morphology and behavior. More than 25 years ago, Kay and Cartmill (1977) made a similar point, arguing for the need to understand the mechanical relationship between a trait and its function. Kay (1984) cautioned sequence on the right shows a short-tailed opossum losing its balance as it begins to move quadrupedally (A), rolling sideways (B, C), and ending upside-down (D). Despite being three times heavier, woolly opossums are capable of keeping their balance on these relatively small supports compared to short-tailed opossums because of more prehensile hands and feet. Opossums on left and right columns are not pictured on the same scale. anthropologists, by way of an example, that the fact that all primates share a petrosal bulla and are arboreal does not functionally link this morphological trait with living in the trees. More recently, Lauder (1996) summed up the pitfalls of relying solely on morphology to infer the mechanical function of a trait. He noted that structure and mechanical function are not always tightly matched and pointed out that "... in our desire to draw conclusions about biological design and to support theoretical views of how organisms are built, we have been too willing to make assumptions about the relationship between structure and mechanical function (Lauder, 1996: 56)." Furthermore, Lauder (1996: 56) emphasized that "... we have not often conducted the mechanical and performance tests needed to assess the average quality of organismal design." In other words, in order to better understand the relationship between a morphological trait (or complex of traits) and its mechanical function, we have to rely on experimental methods and techniques. The importance of an experimentally based approach in biological anthropology was recognized more than 50 years ago by Washburn who called for a "... modern experimental comparative anatomy to take its place among the tools of the student of evolution (Washburn, 1951:67)." Since then, numerous biological anthropologists answered that call with vigor (e.g., Demes et al., 1994; Demes et al., 2001; Fleagle et al., 1981; Hylander, 1979a,b; Jenkins, 1972, 1981; Kimura et al., 1979; Marzke et al., 1998; Schmitt, 1999; Schmitt and Lemelin, 2002; Stern et al., 1977; Tuttle and Basmajian, 1974). Although a wide range of experimental techniques are available to biological anthropologists (Biewener, 2002; Fleagle, 1979), they are all used with the same underlying principle. An experimental analysis involves direct observations, such as muscle activity, movement, external forces, or internal strains of an organism behaving in a certain manner. By "perturbing" the behavior, that is changing the substrate, task, food, or other variable, the experimenter can directly measure the quality of organismal design. The outcome of such an experiment is threefold: in the first case, experimental results support the proposed link between morphology and mechanical function. In the second case, the functional relationship (e.g., large humeral tubercles and terrestrial locomotion) and inferences drawn from that morphology are correct, but the experimental data revise the underlying mechanical role of the morphological trait in question (e.g., supraspinatus muscle is a humeral stabilizer, not protractor; Larson and Stern, 1989). In the last case, experimental data reject the proposed structure-function relationship such as that between long bone cross-sectional shape and loading patterns (Demes et al., 2001; Lieberman et al., 2004). In the previous section, we assessed the quality of organismal design by testing the link between structure (i.e., relatively longer, more grasping digits) and mechanical function (i.e., stay balanced and moving on thin, flexible branches) in two opossums species. In the following section, we present the results of an experimental analysis that also assesses the quality of organismal design. More specifically, we test the relationship between locomotor characteristics typical of all primates during walking (i.e., DS gaits, protracted arm position at fore-limb touchdown, and relatively lower forces on the forelimb) and fine-branch arborealism. Just like grasping extremities, these locomotor features are present in most primates and are likely to have characterized the last common primate ancestor. Therefore, a comparison outside of primates is again needed. Our comparative strategy is inspired by the phylogenetic bracketing approach (Witmer, 1995), which "serves as a rationale for experimental studies..." (Susman, 1998: 27). However, we take a slightly different approach in that we are not attempting to interpret the anatomy of a fossil species. Instead, we are attempting to understand the functional significance of locomotor features that characterized the earliest primates, using three bracketing taxa. Locomotor mechanics will be compared: (a) between two closely related opossums that have diverged ecologically (Monodelphis domestica and Caluromys philander) and (b) between two distantly related mammals, a didelphid marsupial and a cheirogaleid primate, that have converged ecologically (Caluromys philander and Cheirogaleus medius). As stressed earlier, convergence represents one of the strongest sources of evidence to infer adaptation (Brooks and McLennan, 1991; Biewener, 2002; Larson and Losos, 1996; Vogel, 1998). Figure 10. Laboratory setup used in this study. See text for details of the laboratory equipment and connections between various hardware elements. Monodelphis domestica (five males: 120, 122, 150, 154, and 156 g, respectively), and four Cheirogaleus medius (one male: 300 g; three females: 270, 295, and 300 g, respectively). Prior to each experiment, the fur covering the limbs was shaved to facilitate measurement of arm protraction at forelimb touchdown. Animals were allowed to move freely within a clear Lexan enclosure (3.6-m long). The floor was made of 28-mm thick plywood covered with a coating of polyurethane and sand. In the floor of the runway, a Kistler force platform model 9281B (Kistler Instrument Co., Amherst, NY) was mounted. For locomotor data collected on the runway, a rectangular section of plywood was instrumented onto the surface of the force platform. A plywood mask flush with the floor of the runway and surrounding the instrumented section by 2-3 mm gaps was then positioned to cover the rest of force platform. The simulated arboreal supports consisted of a graphite pole (7 mm in diameter) and wooden pole (28 mm in diameter) painted with a mix of white paint and sand, and coated with polyurethane. Each pole consisted of two 1.2-m-long segments mounted on a series of aluminum struts with adjustable height and fastened onto a wooden board. Each pole section was then attached onto the surface of the runway and positioned on each side of a 5-cm-long central segment with 2-3 mm gaps separating them. This central segment of the pole was attached on a wooden platform by one or two rigid aluminum struts that did not interfere with gripping of the pole during locomotion. This wooden platform was in turn fastened with T-bolts onto the grooves of the surface of the force plate. We collected data on the ground and 7-mm pole in Caluromys, the ground and 28-mm pole in Cheirogaleus, and the ground only in Monodelphis. Subjects were videotaped at 60 Hz using electronically shuttered (1/1000 s) normalspeed JVC GY-X3 video camera (JVC Professional Products Co., Wayne, NJ) and Panasonic 5100HS video camera (Matsushita Electric Co., Secaucus, NJ) positioned perpendicular and frontal to the moving subject. 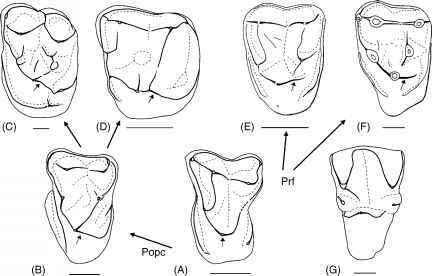 Both lateral and frontal views were used to assess the footfall pattern of the animals. 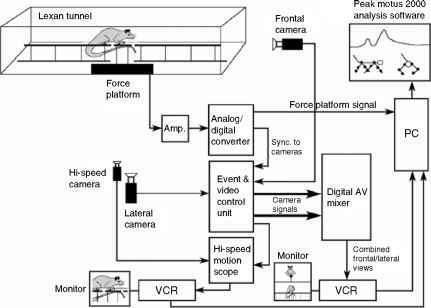 In addition, a Motion Scope® high-speed digital camera (Redlake MSDA, Inc., San Diego, CA) set at 125 or 250 Hz and positioned lateral to the moving subject was used to obtain precise kinematics of the forelimb. At the same time, substrate reaction forces were recorded with the force platform. The analog signal originating from the force platform was amplified using a Kistler 8-channel charge amplifier model 9865 and then converted into a digital signal using an AnalogDigital Converter designed by Peak Performance Technologies Inc. (Englewood, CO). Views from the normal-speed cameras (lateral and frontal views) were merged into a single, split screen view using a Panasonic Digital AV Mixer WJ-MX50A (Matsushita Electric Co., Secaucus, NJ), and images were recorded on videotape using a Panasonic Video Cassette Recorder AG-7350 (Matsushita Electric Co., Secaucus, NJ). Images from the high-speed camera were also recorded on videotape using the same model VCR. Video and force plate data were synchronized in the following way. All normal-speed cameras were synchronized using the signal from a single master camera routed through the Event and Video Control Unit (EVCU) and then passed into the gen-lock adapter of other cameras. This assured that all cameras were recording at the same rate and that the fields were synchronized. The force plate was recording data constantly into a buffer until it received a signal from a handheld trigger. At this point, force data were stored in the computer. This signal from the handheld trigger, referred to as the event signal, generated in turn a second signal via the EVCU. This second signal, here called the sync signal, was created as soon as the next available video field passing through the EVCU was encountered. Event and sync signals may occur simultaneously or be off by as much as one field (1/59th s). This sync signal indicated to the computer to store 1 s of data prior and after the triggering of the event signal. The event signal also triggered the highspeed camera to store data before and after its triggering point (1 or 2 s before and after the triggering point at 250 or 125 Hz, respectively). The triggering point of the event signal is designated as 0000 ms on the image of high-speed camera. The EVCU also generated a bar code visible in the right upper hand corner of the videotape image. One line of this code thickened at the triggering of the event signal. This bar code change allowed visual synchronization of all video images, force plate, and high-speed camera. Finally, the signal was digitally encoded onto the videotape. When video was downloaded into the computer, this digital marker was used by the motion analysis software to precisely coordinate video and force data. For each species, the footfall pattern, arm protraction angle, and peak vertical Vpk were analyzed using Peak Motus 2000 movement analysis software (Peak Performance Technologies, Inc.) running on a personal computer. Only strides for which subjects moved steadily across the instrumented section of the force platform (with two strides prior to and after contacting this section) were used for analysis. Video data were imported to the computer and synchronized with the kinetic data from the force platform using the procedure described earlier. For each step examined, footfall pattern was determined using the frame-by-frame analysis and arm protraction (i.e., angle of the arm relative to horizontal body axis) (degree) was calculated from digitized X and Y values at the shoulder, elbow, and wrist joints. After filtering the raw force data (30 Hz Butterworth digital filter), substrate reaction forces (F ) were calculated. Differences in arm protraction between taxa were tested with the nonparamet-ric Mann-Whitney Latest (Sokal and Rohlf, 1995). Mean Vpk for the forelimb and hindlimb were calculated. Forelimb/hindlimb peak vertical force ratios were computed and logged (ln), and then compared between taxa. Since Muybridge (1887) first filmed baboons walking quadrupedally, it has been well recognized that primates rely on a different footfall pattern during walking compared to most other mammals (Cartmill et al., 2002; Hildebrand, 1967, 1976, 1985; Larson, 1998; Lemelin et al., 2003; Magne de la Croix, 1936; Rollinson and Martin, 1981; Vilensky and Larson, 1989). During quadrupedal walking, most nonprimate mammals, such as cats, dogs, or horses, use lateral-sequence (LS) walking gaits in which each hind footfall is followed by the ipsilateral fore footfall. The resulting footfall sequence is then: right hind, right fore, left hind, left fore (RH RF LH LF). In contrast, primates rely mostly on DS walking gaits in which each hind footfall is followed by the contralateral fore footfall. The resulting footfall sequence is then: right hind, left fore, left hind, right fore (RH LF LH RF). Two main categories of hypotheses have been offered to explain the predominance of DS gaits in primates (Cartmill et al., this volume; Lemelin et al., 2003). Biomechanical hypotheses, such as the more posteriorly placed center of gravity and hindlimb dominance, have been invoked to explain the common usage of DS gaits in primates (Rollinson and Martin, 1981). Neurological hypotheses consider the prevalence of DS gaits in primates as a by-product of greater supraspinal control of forelimb movement involved during grasping, manipulation, and reaching (Larson, 1998; Vilensky and Larson, 1989). Despite disagreeing on the mechanisms involved in the production of DS gaits, both categories of hypotheses make clear that traveling and foraging in a thin-branch habitat was a major impetus in the origin and evolution of such gaits in primates. Figure 11. Comparison of the footfall pattern between Monodelphis domestica (left) and Caluromys philander (right). The left panels show sequentially a lateral-sequence footfall pattern (RH RF LH LF) in Monodelphis when walking on the runway. The right panels show sequentially a diagonal-sequence footfall pattern (LH RF RH LF) in Caluromys when walking on the 7-mm pole. Each image represents 1/250 s. Opossums on left and right columns are not pictured on the same scale. DS gaits exclusively when walking on the smallest poles suggests to us that these gaits are more advantageous functionally compared to LS gaits when walking on narrow supports. The functional advantages underlying the origins and evolution of DS gaits in primates and marsupials are discussed in detail in Cartmill et al., (2002, this volume) and Lemelin et al., (2003). Compared to other mammals, primates have relatively long limbs (Alexander et al., 1979; Polk et al., 2000) with more mobile joints (Reynolds, 1985b; Schmitt, 1999). These morphological differences are associated with fundamental kinematic features that distinguish primates from other nonprimate mammals. For example, primates take longer strides when walking quadrupedally (Alexander and Maloiy, 1984; Reynolds, 1987). Larson (1998) and Larson et al., (2000, 2001) reported differences between primates and nonprimate mammals in the degree of arm protraction at forelimb touchdown. Most nonprimate mammals have a retracted arm position at touchdown, that is, the arm lies behind a vertical line going through the glenohumeral joint (i.e., angle between arm and horizontal body axis is less than 90°). In primates, the humerus is more protracted at touchdown, that is the arm is ahead of that same vertical line (i.e., angle between arm and horizontal body axis is greater than 90°). These differences in the degree of arm protraction between primates and small nonprimate mammals have been confirmed for the most part by cineradiographic studies (Fischer et al., 2002; Jouffroy et al., 1983; Schmidt and Fischer, 2000). This combination of relatively long and more mobile forelimbs, longer strides, and more protracted forelimb postures is believed to have evolved for the need of reaching out when grasping branches and food with the hands (Larson, 1998; Larson et al., 2000; Schmitt, 1998, 1999). Again, the contrasts between more terrestrial and more arboreal opossums (Monodelphis and Caluromys), as well as between two fine-branch arborealists (Caluromys and Cheirogaleus) can provide a better understanding of the possible functional link between arm protraction and fine-branch arborealism. Figure 12. Comparison of arm protraction at touchdown for Monodelphis domestica (A), Caluromys philander (B), and Cheirogaleus medius (C). The arm is more protracted (i.e., higher angle) in the woolly opossum (B), a pattern more similar to that of the fat-tailed dwarf lemur (C) and other primates, compared to the less protracted arm of the short-tailed opossum (A). (Table 1), and its mean is closer to the primate average of 118° than the marsupial average of 90° reported by Larson et al., (2000). 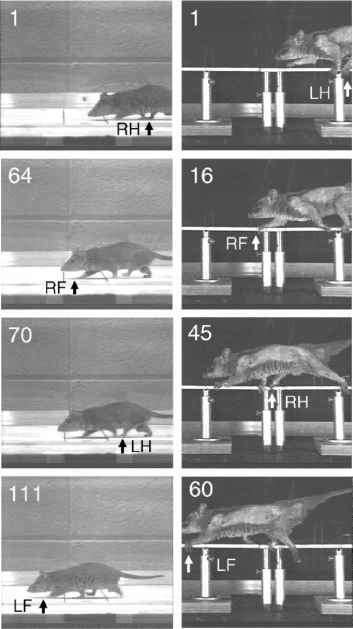 Unlike the changes in gait patterns we reported above for woolly opossums, no differences were observed in the degree of arm protraction at touchdown between the small 7-mm pole and the runway (Table 1). Our arm protraction angle average for Cheirogaleus (121.9°) and average arm protraction angle reported by Larson et al., (2000) for cheirogaleids (128°) differ widely from that reported for Microcebus murinus (78°) by Fischer et al., (2002). Similarly, our arm protraction angle average for Monodelphis domestica (101.4°) differs from the arm protraction angle average reported by Fischer et al., (2002) for the same species (62°). The degree of arm protraction we observed in Monodelphis is more similar to that reported by Jenkins and Weijs (1979) in their cineradiography study of Didelphis. These differences may be the result of different methodologies involving unrestrained locomotion (Larson et al., 2000, 2001; this study) versus a treadmill for which speed varies constantly in order to keep the animal in front of the X-ray beam (Fischer et al., 2002). Our results show that animals like Caluromys and Cheirogaleus that spend more time moving and foraging on thin and flexible branches are characterized by greater ranges of motion in the shoulder region. Such increased ranges of motion may allow greater reaching capabilities when grasping arboreal substrates and collecting food with the hands. In this regard, Argot (2001) and Szalay and Sargis (2001) reported that compared to other more terrestrial didelphids, Caluromys has a triangular-shaped scapula with well-developed supra- and infraspinous fossae and a prominent acromion, as well as a more globular humeral head rising above the level of the tubercles. All of these features of the shoulder region are typical of arboreal primates that engage in climbing and other antipronograde behaviors (Ashton and Oxnard, 1964; Ashton et al., 1965; Harrison, 1989; Larson, 1993; Oxnard, 1963, 1967; Roberts, 1974; Rose, 1989). This morphological evidence, in combination with the arm protraction data we presented, strongly suggests these primatelike traits of the forelimb evolved in Caluromys to facilitate movement in a discontinuous, fine-branch milieu in which walking with longer strides and reaching with grasping hands were essential behavioral components. The evolution of forelimb joints with increased mobility, at the expense of stability in primates is associated with reduced weight-bearing function of the forelimb during locomotion. Two dynamic mechanisms that reduce forces on the forelimbs during locomotion have been identified in primates: active weight shifting on the hindlimbs (Reynolds, 1985a, b) and gait compliance (Schmitt, 1998, 1999). These mechanisms underlie a fundamental kinetic difference that separates most primates from all nonprimates. During walking, the forelimbs of nonprimate mammals experience higher Vpk relative to the hindlimbs, whereas the reverse is true for most primates; Vpk are lower on the forelimbs relative the hindlimbs (Demes et al., 1994; Kimura et al., 1979; Polk, 2001; Reynolds, 1985b; Schmitt and Hanna, 2004). These differences in vertical force distribution are believed to represent a shift in the functional role of the forelimb that occurred with the origins of primates in an arboreal setting (Kimura et al., 1979; Larson, 1998; Schmitt, 1999, 2003a,b; Schmitt and Lemelin, 2002). This functional shift, from a weight-bearing strut used for propulsion to a grasping organ used for reaching and manipulation, has been a recurrent theme in models of primate origins since Jones (1916). Whether or not a shift in the vertical force distribution of the limbs, and ultimately a shift in the functional role of the forelimb, can be linked to the invasion of a fine-branch niche by the earliest primates can be addressed again with the contrasts between opossums and cheirogaleids. Figure 13. Mean ratios of Vpk for the forelimb versus hindlimb during walking in opossums (shaded boxes) and a cheirogaleid primate (white box). The ratios have been ln so that ratios greater or less than zero (i.e., equal forelimb and hindlimb peak vertical substrate reaction forces) are weighted equally and can be directly compared among taxa. Data for woolly opossums have been collected for both runway and 7-mm pole. of a fine-branch niche. In the context of primate origins, this represents strong evidence that the last common ancestor of all primates was a fine-branch arbo-realist, very similar to the woolly opossum in behavior and ecology (Schmitt and Lemelin, 2002).